Not too long ago, a craze hit Kickstarter in a huge way The Gadgets And Games Of Kickstarter: June 21st 2013 Edition The Gadgets And Games Of Kickstarter: June 21st 2013 Edition Each Kickstarter is its own drama representing the hopes and dreams of at least one person. Will it succeed? Will it fail? Will it become a media sensation? It’s impossible to know before the money... Read More . That craze was the Android micro-console. First, the OUYA (which we reviewed OUYA Review And Giveaway OUYA Review And Giveaway When the OUYA was first announced and funded on Kickstarter, the Internet was positively buzzing over the possibilities for this tiny Android-based console. Kickstarter backers began receiving their consoles months ago, and early reports were... Read More ) exploded on Kickstarter. Immediately after that, the much smaller GameStick hit the crowd-funding service, and while it did not explode in the same way as the OUYA, it still commanded far beyond its funding goal. Now, months later, we have the $79 GameStick and its controller in our hands, and we’ve had some time to explore the games available, and of course, play them. How is the console? How does it compare to the OUYA, or even a more traditional game console? Keep reading the review to find out. We bought this GameStick ourselves, we’ve tested it, and now we are giving it away to one lucky reader! Find out how to win your own GameStick, so you can get in and enjoy some Android gaming without spending a dime. The GameStick was designed to be the most affordable, open and portable TV games console ever created. While they managed to nail their goals in terms of pricing, personally, the GameStick is just about as portable any other gaming console — not very portable at all. Why make a portable gaming console without a screen? The need for a TV negates the notion of portability, and puts the GameStick in the same category as other Android games consoles; mainly the OUYA and Mad Catz M.O.J.O. — so we’ll be comparing the GameStick to those consoles. If you’re looking for a truly portable video game console, you might want to consider the NVIDIA Shield NVIDIA Shield Review And Giveaway NVIDIA Shield Review And Giveaway Recently, we reviewed the Wikipad, which managed to make its way to market before NVIDIA's highly anticipated Shield. Ever since NVIDIA showcased the Shield at CES, I've found myself more and more fascinated by it. After... Read More . 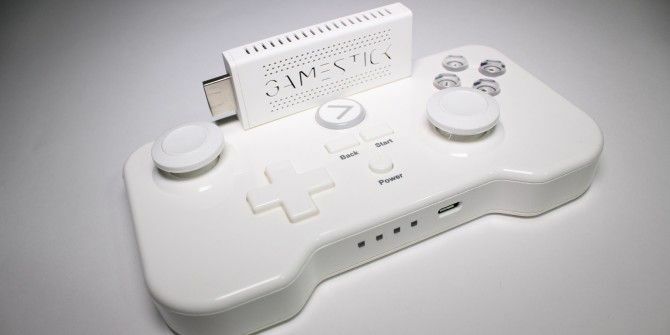 The GameStick is an Android-based gaming console, like the OUYA and Mad Catz M.O.J.O. (which we also reviewed Mad Catz M.O.J.O. Android Gaming Console Review and Giveaway Mad Catz M.O.J.O. Android Gaming Console Review and Giveaway Mad Catz, a company best known for its range of accessories for existing consoles, is jumping into the space with a $250 device known as M.O.J.O. Read More ). Unlike those consoles, the GameStick is incredibly tiny. At first glance, it actually looks like a thumb drive, and it’s small enough to fit inside of the controller for easier transporting. One major selling point of any of these Android consoles is the price. When they were first pitched by the companies, they talked about granting gamers the ability to play games without spending big bucks. From a price perspective, the GameStick beats all of the competition — it retails for just $79, while the OUYA, with similar specifications, costs $100. The GameStick has a clear edge, but price isn’t everything. At $79, it still needs to deliver a solid gameplay experience. The Mad Catz M.O.J.O. costs a lot more at $249, but it’s also quite a bit more powerful than the other two. So when the GameStick arrives at your home, what will it be like to crack open the box and get to playing? Well the first thing you will notice is that the console is actually quite small, as advertised. It’s only slightly bigger than an average USB drive, and since it connects to the TV through HDMI, it literally has zero footprint on your media center. On MHL-compliant televisions, the GameStick micro-console can draw sufficient power through HDMI alone. For non-MHL televisions, it accepts power through micro-USB, which you can connect to either your television’s USB port, or to a wall outlet with the included power brick. This means the GameStick isn’t as ultra portable as advertised, and requires carrying an additional cable around, if not the power brick as well. The other thing you will probably notice is the controller — it’s rectangular. The last rectangular controller I can recall using is that of the NES, which was released in 1985. If you’ve played with the NES, you should know that while it gets the job done, holding a rectangular controller can be uncomfortable after a while. Thankfully, the edges are slightly rounded, which should alleviate some of the hand discomfort the NES used to cause back in the day. We’ll get to just how it feels to play games on the controller in a bit. As for what comes in the box, you will find the GameStick console, the controller, an HDMI extender cable that will allow you to hook up the device if there is not enough space between HDMI ports, two USB cables, a power adapter, and the paperwork you will need to get everything up and running. We should also mention that during the setup process, our GameStick malfunctioned. We contacted GameStick support and they set us up with the files we needed to copy to a thumb drive in order to reinstall the device’s software within 24 hours. The cable that is used to power the device has a splitter on the end that can be used to allow the console to read the files on a thumb drive. So just what is under the hood of the GameStick? For the CPU, it features an ARM Cortex A9. The GPU is a multi-core Mali 400. It also comes with 8GB of onboard memory for storing games purchased from the store, as well as support for microSD cards up to 32GB. For connecting to the Internet, 802.11 b/g/n Wi-Fi is included. No wired Internet is available, so you will need a wireless connection to get online and use the micro-console. It also has Bluetooth 4.0 for connecting the controller. While the specifications cannot compare to the Tegra 4 featured in the Mad Catz M.O.J.O., very few Android games are actually able to harness that power, and as such, the GameStick is sufficient for the games offered through its store. While not cutting edge by any stretch of the imagination, it definitely gets the job done for playing the types of games it aims to bring to players. The GameStick console is just a tiny white plastic stick with an HDMI plug sticking out of the end, and a micro USB port near the other end. That being said, it’s a pretty nice looking little console, which glows white when the console is powered on. As for the controller, there is a lot more room to work with. As I said previously, the controller is rectangular in shape, but it has slightly rounded corners that make holding it more comfortable. It has a d-pad, two joysticks, four face buttons, two shoulder buttons, and four buttons in the middle of the controller. I have a fairly major problem with the controller that I noticed as soon as I tried to use it to type on the onscreen keyboard. That problem is the joysticks, which are far too sensitive. They seem to have almost no dead zone, which makes precision movement an issue. I found that typing with the d-pad was much easier and far more accurate. The last key design aspect of the GameStick is the interface, which is incredibly simple. On the left side of the screen you will see Games, Media, your user name, and Settings. You navigate through these menus using the up and down buttons on the controller. Above the list of apps you will see menus for featured games, those you can play now, popular apps, and a complete list of all apps. The most important one is called “Play Now,” which is where games you have downloaded will appear. I think it would have been better if it was just called Downloads, because if you didn’t know where to look, you might not know where your downloads ended up. Overall, the look of the operating system is nice, and it’s mostly easy to navigate. However, the main reason it works in its current state is because there are so few games. Over time, more games will populate the store until a point where navigating it will be too cumbersome. Playing games on the device is a decent enough experience, but sadly, it’s very limited by the few games available on the service. As of this writing, there are only 71 games available, which might sound like a lot, but is put into perspective when you compare it to the OUYA’s 199 games — and the OUYA didn’t have much of a head start either. Of the games in the library, only four of them are free, so if you really want to jump in and do some gaming, you are going to need throw down some money. Thankfully, most of the games are under $5, so they’re affordable. However, unlike the OUYA, there’s no trial option, so you can’t really test them out before committing to a purchase. Personally, the ability to test paid games before buying them was one of my favorite features on the OUYA, and I wish the GameStick offered the same feature. As for the type of games you will find, most of them are pretty standard Android games. Titles like Ski Safari, Edge, and plenty of other staples are available for purchase. There are some shooters and the like on the store, but of course, this device won’t replace your Xbox One (see our review Microsoft Xbox One Review And Giveaway Microsoft Xbox One Review And Giveaway The console wars are officially raging, and we've had sufficient time with both of them. That begs the question: how does the Xbox One compare? Read More ) or PlayStation 4 (our review Sony PlayStation 4 Review And Giveaway Sony PlayStation 4 Review And Giveaway Ladies and gentlemen, the next generation of video game consoles is here, with the Sony PlayStation 4! Read More ). That’s not really what it sets out to do anyway, so we can’t knock it for that. The gaming experience is average, but the GameStick controller is not the best I’ve used by any stretch. I thought the OUYA had among the worst controllers I’ve ever used, and the GameStick isn’t far off. The rectangular shape, while not necessarily the best, isn’t really the problem, but the loose joysticks are. They just don’t feel precise at all, and they really hinder the gameplay experience. As far as game consoles go, there is really nothing special about the GameStick. The games are your standard Android stuff, and it doesn’t seem like PlayJam, the company behind the device, is putting nearly as much effort into getting games on the platform as OUYA. With time, we do expect more games to hit the service, but it’s limited right now. That being said, if you are looking for a gaming console to put in a child’s bedroom that is affordable with a bunch of cheap games, the GameStick will certainly do the job. Not every family can commit to spending over $400 on a game console, so letting kids play games on the GameStick, at just $79, isn’t such a terrible idea. For the more serious gamers, though, the games found on the GameStick will probably be a disappointment. The GameStick is a competent media player, though not the best. There are only two apps available under the media section of the device, but it has the only one you truly need to get what you want – XBMC. With it, you can install all of the third-party addons you would expect, including any of the piracy-orientated ones, though we don’t necessarily recommend using those. As you might expect, you’ll use the GameStick controller to navigate through XBMC. The problems with the overly sensitive joysticks really stand out when trying to type on the on-screen keyboard, but it’s something you will get used to after a while. Even if you don’t plan to do much gaming with the GameStick, a tiny $80 dollar XBMC player is an idea worth entertaining. It costs about the same as Roku, but it does give you the bonus of playing games as well. However, you will notice many of the big names in media are not available. Netflix, Amazon, and Hulu are all absent, which is quite surprising, considering those services seem to be available on any device that connects to a TV. If you want to play games and consume media, this is not a bad option. However, if you are just looking for a media player, then a dedicated device or even a Raspberry Pi 6 Amazing Ways The Raspberry Pi Is Making A Difference 6 Amazing Ways The Raspberry Pi Is Making A Difference I'll try to avoid techno-babble words like "disruptive" when I say this, but there's no denying - Raspberry Pi is changing the world. Read More is probably a better option. Although the GameStick was designed primarily for portability, we can’t recommend it because without a built-in screen, it’s just not a portable gaming console. If the argument is the ease of transport, then how much easier is the GameStick to put in a box, as opposed to the OUYA or M.O.J.O.? All in all, the GameStick is a pretty decent device, but it’s not great. There aren’t that many games on the store, and even fewer of the games are available for free. It’s an acceptable media player with XBMC, but it’s not fantastic. That’s kind of the story of the device – everything is okay, but it doesn’t seem to light the world on fire in any category. However, it’s only $79, so it’s really not a huge commitment. Congratulations, Ian Stedman! You would have received an email from jackson@makeuseof.com. Please respond before April 4 to claim your prize. Enquires beyond this date will not be entertained. The One DSLR Accessory You Should Buy: Zhiyun Crane 3 LabShould You Buy A Smartwatch Now, Or Wait? Yes I agree. Good and fair review. Yes, I think you're right on! Agree. All in all, the GameStick is a pretty decent device, but it’s not great. yes i totally agree with u .
I am completely agree with your assessment of the gamestick. The review seems fair. As my family already has a Roku for each TV and an Android-based tablet for each person, I'm sorry to say I haven't found much reason to purchase this or any other Android gaming console though--beyond the new-gizmo-with-blinky-lights reason, of course. I do like me a new gizmo with blinky lights. It is a great review. I agree with it. My sons would love it! I really want one of these , Its looking too simple and powerful.Great platform to develop my own android game , atleast Its better than phone .All ?ndie game developers should consider that great alternate carefully. Yes, agreed. Can't believe there are so many options for gaming. Yea no doubt. This little guy is not a game system replacement .If that was what i wanted id go for the shield. It would make a nice lightweight media player though and I have a perfect use for it! Makeuseof.com always makes an interesting and honest assessment of devices. I find myself always coming back for more and also seek the reviews here before buying things. Thanks and keep up the good work. ... a pretty decent device, but it’s not great. I could certainly use it the way it is. I do agree on making it more portable, but to have something connected to it like it is, I would not complain one bit. I have a tv at work I can hook it up to. It's a great little device and your review is spot on. Thanks. Yes, i agree. Considering it's price, it's ok for a child. This would be great for my kids. Id buy one. Great review, the price is key. Agree, especially with how there's no real market demand for an Android gaming console at the moment. I agree, but I would like to check out the Media Player side of it. Yes I do, technology can be a little behind, but for such a compact design it does its job well. yes the review covered most the things...a few details like response time and ergonomic suitabilty would help more(for the controller)...though it already is excellent! Very well written, will get one for my son I think. I do not own a TV so I will not be entering this contest! Love most of your contests!! I feel like it's a reasonable assessment. I'd have to use it to be sure. I have just given exams and want a way to relax. I hope I win this. I like cheap thrills. And I am in love with games. I do agree, I trust your expertise! Yes I do. Great job btw. I can't say, I agree, but then again, I've only played on a PS2 and Xbox360 and those are great consoles, so going portable really helps. Doesn't seem much need to waste time on this one. On the side note, Xbox controller is the best. I agree. The world just isn't in a huge rush to buy Android consoles! They should add Chromecast-like support to it. Agreed, it doesn't seem to do anything great in the end. great for my grandkids and will not break the bank. I agree. Its a traditional console for this house. Yes I agree with your assessment! Wouldn't mine owning one as well. I don't think I agree. I think the GameStick could be useful and entertaining for those on a budget. Some folks don't have $400 to invest in a high end system. This $79 gadget can fill a gap for people who don't have a lot of money to allocate to a system as well as to purchasing less expensive games. Hopefully for those who DO invest in this system the games WILL keep coming and keep the prices LOW as well. I will develop for it, if I win It. Yes I agree, very well said. ? Seems well and fine, though I don't particularly like the physical design...way too squared for me. (Not that I wouldn't like the chance to give it a try.) I'm always willing to try something new. I have an OUYA. I just don't think the GameStick will open up enough for me to be interested. If I had small children at home I may consider it. One issue I would have is that my TV is mounted on the wall and the HDMI port is on the back so it wouldn't fit anyway. From your description and video, this sounds like a cool device - better than an Ouya. I'd love to be able to attach a small LCD screen to it and make it *completely* portable. I disagree. $79 is much to pricy for this. I have many things in my household that is already capable of playing games so to buy another standalone product with little support is going to be difficult to justify. My kids are just going to stick with my 3DS or cellphone/tablet for mobile gaming and smart TV, console, or PC for other gaming. I agree but you might as spend a little more for a 2DS if you really want to play videos or just stick with mobile games. I can't really say if I agree or not seeing as I've never used the Gamestick console before. I do think that $79 (approx. £49 over here) is a very reasonable price for any console so can you really be disappointed that it turned out to be just okay? My Xbox 360 is on it's way out, cutting out on me mid-game or freezing, but I can't afford a new console, so something cheap like that really appeals to me - and even if there isn't a whole deal of games for it, there may eventually be. Honestly, I believe there are better options out there for both gaming and media, so I don't think this one is all that amazing. This kind of reminds me of the cheapo game devices you used to see at cheap shops. It's updated and all and the technology has gotten to the point were a small little device like this is practical but still... I see this and I think it's going to break or have sucky games. I'd like to try it though all the same. I would probably buy one at $20 since it's just okay. I agree but for $79 dollars I think it would be fun to buy and play around with. it asked me whether I agree with the assessment of the evice. How could I have an opinion unless I had the device? I wouldn't read the review if I had it. I don't know...I'd love to try it. and even fewer of the games are available for free. Seems accurate. Like most things Android, we need to give the XDA folks a few months to tinker before it will really sing. I know that the limited game selection would be the big hurdle for me. It's a good gadget to have if no other option is available! I agree, but I'd go for the one Huawei showcased at the recent CES event. Far better value for money. I would also like to agree !!! One of my coworkers was a backer on the project and I have to say that I was impressed with the power in the GameStick despite its size. I have a hard time making a good case for having one, though. It was fun to play and I loved the portability, but unless I was a travelling salesman there didn't seem to be any real reason to have one. A definitive yes for your assessment of the gamestick! I agree with you. Still despite the shortcomings it looks fun for casual gaming. Fair assessment, though I think a better alternative for the kids bedroom might be a PS2 or even a Gamecube as they're generally around the same price now and have much better libraries, and therefore choice, of games. PS2 even doubles up as a DVD player. Not sure how I can agree or disagree with the assessment when I've not tried it myself. Yes, I think your assessment was spot on. Totally agree! You guys are spot on with the assessment! I agree that it isn't a game changer or anything close to outstanding. I'd rather a cheap tablet with better specs with micro HDMI and Bluetooth for a better experience, actual portable gaming with the option for Bluetooth or wireless controllers, full access to the Play Store, Amazon Apps, and more with more free have options, and ability to have access to already purchased content. I can get similar actin on my Favi Stick, which costs less and has access to more stuff, minus the game controller. This leaves room for a better controller, although not all games are compatible with the Favi Stick. Instead, I'd use my LG G2X that is no longer being used as a phone since it is more powerful, has micro HDMI port, Bluetooth, and has Tegra Zone access. Nice idea, ok for kids, but better can be had at comparable pricing that actually is portable for gaming and media content consumption. A refurbished Moga controller made for attaching to tablets and phones can be had for $20 or less (I can get them for $13 with free shipping). I say meh for effort, but bleh for execution. Your review makes sense to me . I agree with you. these are very hit and miss, with mostly miss. I will wait for something that is definitely good. Your assessment seem to be accurate, but I would need to test it further to see if Its perfectly accurate. Yes, I agree with your assessment of the GameStick. It's worth noting that anything that does XBMC can also install a plugin to support Plex (yay), but sadly the Android version of XBMC is fairly limited in its capabilities. It can only output two channel audio (boo). Also, the reviewer doesn't indicate whether the device is capable of decoding 1080p video streams, something that is inconsistent between Android XBMC builds. Finally, like all bluetooth devices, there's nothing stopping anyone from pairing a proper controller if there is a more preferred input device on hand.